Did you know that there are over 10 million cows in Texas, and our state is responsible for more beef sales than any other state? With that many cows, you know there are miles and miles of fences to keep them contained. Here at Ware Fencing, we professionally install fencing for cattle in Crowley and Fort Worth, TX, as well as the surrounding areas. If you’re interested in learning more about our fencing services and pricing, give us a call today at 817-948-4503, and speak to one of our experienced fence experts! We offer a wide variety of commercial, residential, and ranch fencing options to our clients, and we are sure to have the ideal fence for you! When it comes to cattle fencing, it is important that you understand the state laws regarding livestock and fencing. Depending on the exact location of your property, the laws can vary a bit. In fact, for those of you with extremely large areas of land, you may have different laws applied to different acres! Generally speaking, however, it is a good idea to have adequate enough fencing to keep your cattle from roaming freely into harm’s way. Several of our more popular cattle fencing options are our electric fences, barbed wire, split rail, and pipe and cable fences. The type of fence you use can also vary depending on how you want to use it. for example, a pen to keep the bull away from your heifers will benefit greatly from a stronger fence such as an electric fence. 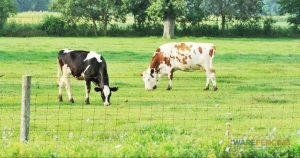 If you merely need to mark the end of the grazing area for your cattle, a cable or wire fence should suffice. Wire Fencing Is A Cost-Effective Way To contain Your Cattle. At Ware Fencing, we have experience installing just about any fence you can think of. If you are interested in learning more about our farm fence installation and repair services, give us a call at 817-948-4503 today. Our experts have been providing fencing for cattle in Crowley and Fort Worth, TX for decades, and we can help you determine what kind of fencing is right for your property and your budget. Keep your livestock safe with a quality fence from Crowley and Fort Worth, TX quality fence company. Updated on September 20, 2018 at 8:54 am by Ware Fencing.